The moment I first stepped onto the azotea, I knew this was the casa for me. 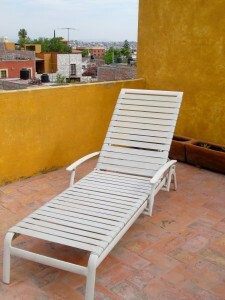 “Azotea” – rooftop terrace – soon became my newest favorite Spanish word and my favorite place in the house to be. Because I’ve always tended to think of life as one big mountain climb, whenever I climb the steep, straight stairway to my azotea from the second floor of this sweet casa, I feel I’ve arrived. I stand by the wall and look out on the busy, sprawling mountain town below, and I feel strangely, blissfully removed from it. As a retired person now, I am freed from all that hectic to-ing and fro-ing. I’m no longer in anybody’s work force. I’m no longer a cog in any country’s machinery. So I’ve got good news for the not-yet-retired: It can be like reaching a mountaintop and planting your own colorful flag beneath a limitless blue sky. Of course, as with other aspects of life, there is also a measure of absurdity in what I see from my azotea. 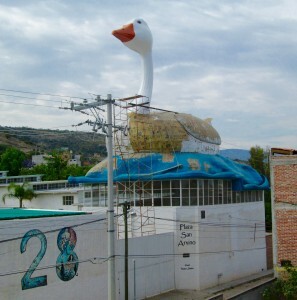 Take, for example, the big duck installation (“el pato gigante,” as everyone here calls it) across the street from me. It’s the size of a large, several-story house, and it sits on top of a hotel that’s never, to my knowledge, been open for business. 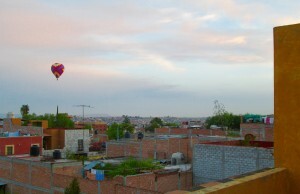 The sight of el pato gigante from my private parapet makes me smile. And it’s a daily reminder to me of my favorite, unanswerable, existential question: WHY??? I love the duck. But good question—WHY? Yes, Barb, everybody asks me “Why?” when they see it — and I don’t have the answer. And “Why?” has always been my favorite question; I used to drive my mom crazy asking it of her when I was a kid. I love all your postings, Bonnie. They are very informative and enjoyable. It sounds like your life is rich and full in your new home. The duck is funny though! You must find out what he’s doing there?!! Great to hear from you, Pam! And thank you for your kind words. The duck comes in handy when I need to tell a taxi driver where I live. I just say (in Spanish) “near the big duck,” and the driver knows exactly where to go! What a lovely azotea!! Me gusta mucho. 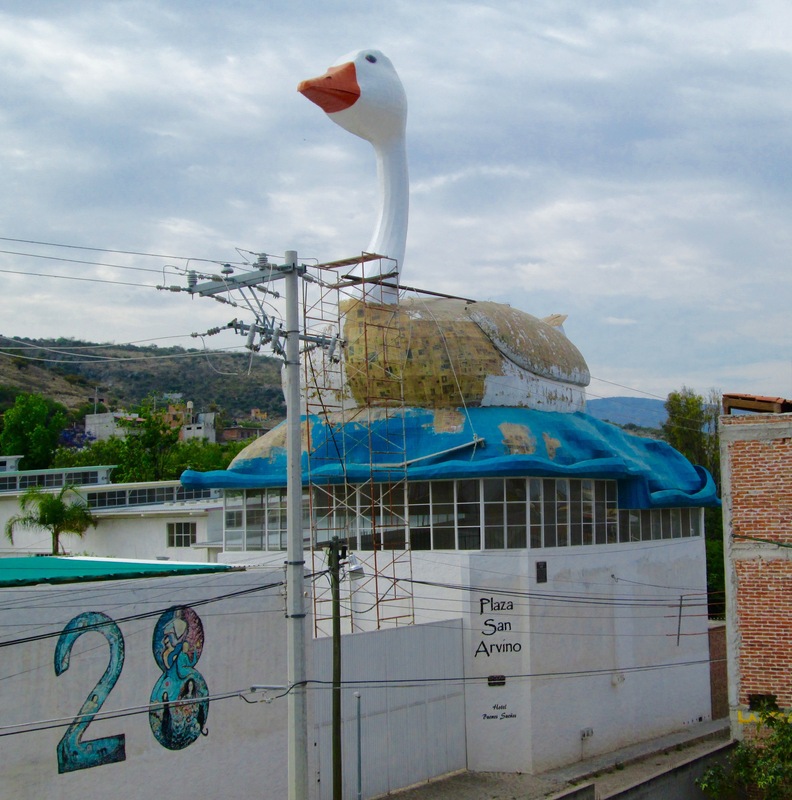 As for El pato Gigante…¿quién sabe? besitos desde Taos…. 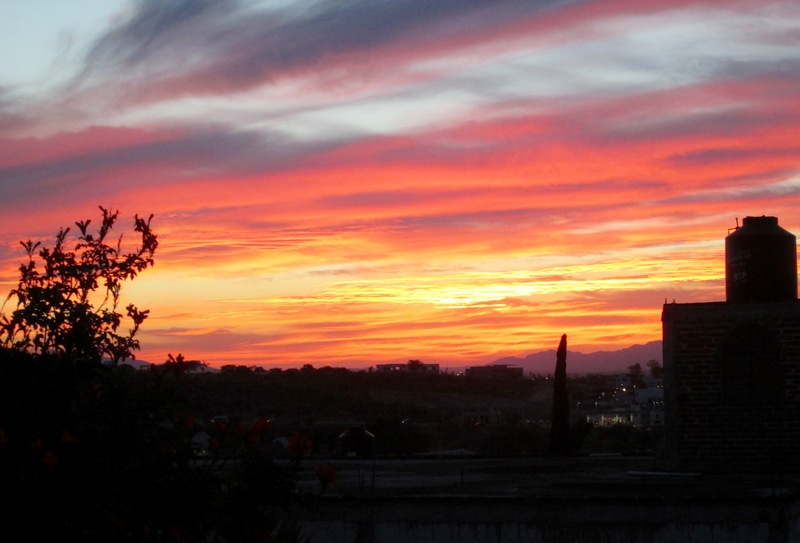 Qur bien que disfrutes de tu azotea y la maravillosa vista que tienes! Disfruta de cada momento que cada uno es especial. Note to WOW readers: Maria Edith is my wonderful Spanish teacher. We have fun! Arvino, an expat from Chicago, owned the land and decided to buildout the space as a community. The hotel is used by friends and word of mouth. He built the goose to be on top of what is an entertainment space. It is quite something and cost a lot of money and aggravation to build the goose. It is articulated to move. There have been a couple of events there for charity. A great fun place! Arvino owns a couple of restaurants here in SMA and hangs with a unique crowd of artisans and eccentric people. I have enjoyed many times in the past having great conversations with him. He is a very unique person. Thanks for this backstory, Babs! I look forward to meeting Arvino at some point and asking him my “Why?” question re the duck/goose installation. Thanks Bonnie—first time, long time.